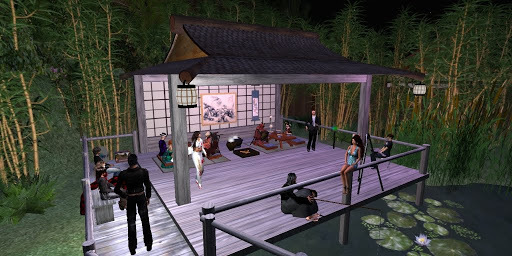 On Sunday Leanna and I hosted a party at the garden and about 30 friends came by, and several came in their Japanese costumes. It wasn’t really intended to be a costume party but it was fitting for the occassion. I’m sorry to say that I didn’t have the presence of mind to be clicking away on my camera but here are a few snapshots I snagged. If you don’t recognize them, that’s Tippy & Steal, simply amazing kimono and samurai attire and with full regalia. And here’s Ellia & Derwin, that’s him hiding under that samurai hat. A beautiful kimono is a joy to behold and Ellie’s kimono was all that. BTW, Der has a wicked sword hanging on his back. The first guest to arrive was Little Yoshiwara geisha okaasan, Xuemei Yiyuan and she helped Leanna and I greet other guests as they arrive. Also, geisha Suzuko (Miyo) joined us in the greeting. Several couples dropped by including Magi & Dillon, Thunder & Jada, Derwin & Ellie, Steal & Tippy, along with other bluesy friends Luci, HK/Henry, Aynnie, Thor, WT, Digory and Bradley. Also other garden friends Takamatsu, Anika and others. And of course, Ziffy delivered one of his really delightful live perfomances. Here are some more photos from the performance. That’s Thor in his warrior threads, altho he spent more time fishing than fighting. And there’s Ziffy to the left playing his sweet bluesy tunes. That’s Thor fishing and Miss Luci watching. This is an overview of the Hut on the Pond, if you squint you can see Ziffy on the right side. There was dancing, but only Henry and I took to the floor. Thanks to the friends who came and the other friends who visited the garden since it opened ten days ago. I am touched by all of your kind words. I am especially happy that many of you responded to the tucked away feel of the pond hut area and the bamboo forest. And thanks to everyone for your donations to this garden. 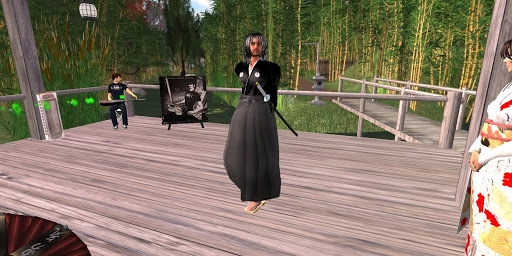 This entry was posted in Events and tagged Events, Geisha & Samurai, Parties, Photography, Second Life, Zen Gardens. Bookmark the permalink.